Did you know that the chain's famous brown bread actually has a special name? The Cheesecake Factory celebrated its 40th anniversary this year by giving away free cheesecake. If you weren't able to grab a free slice, don't worry, there's a good chance you live relatively close to one of the chain's 200-plus location across the countey. But did you know its most popular cheesecake has only five ingredients or that its avocado egg rolls take four hours to make? TODAY Food recently spoke with Donald Moore, Chief Culinary Officer at The Cheesecake Factory, to get a behind-the-scenes look at the beloved restaurant chain with over-the-top portions and lots and lots of dessert. 1. The menu has 250 items and they're all made from scratch. With 21 pages, plus a two-page Skinnylicious menu, the chain's menu is serious reading material. Moore said he gets quite the reaction when he brings other chefs into The Cheesecake Factory. "They look at the menu and say 'You're absolutely crazy to try to make all this food fresh and to buy so many ingredients.'" Making all 250 items requires 700 ingredients and everything — including more than 160 sauces and dressings — is made in the restaurant's kitchen. Food prep starts at 6 a.m. each day. 2. The menu changes all the time. While certain staples (spinach and artichoke dip, anybody?) have been on the menu for years, the restaurant actually rotates a lot of its dishes so don't get too attached to a particular dish. The menu changes twice a year, every year. "We usually add 10-12 things and take off 10-12 things," Moore told TODAY Food. The chain's founder and CEO, David Overton, makes the final decision over what gets the axe. Over the last few weeks, the chain rolled out its latest menu. So far, the most popular new items have been soft pretzel bites with cheddar cheese fondue and the Thanksgiving sandwich — guess people are feeling nostalgic for the holidays already. 3. Its best-selling cheesecake is surprisingly simple. Overton will probably never mess with his late mom's cheesecake recipe. Evelyn Overton's "original cheesecake," which she used to make in her basement in Detroit before the first restaurant was founded in Beverly Hills, is still The Cheesecake Factory's best-selling dessert. And, after more than four decades, her secret recipe has never changed: and it only has five ingredients. The other two most popular cheesecakes that have been on the menu since day one are white chocolate raspberry truffle and fresh strawberry cheesecake. 4. The most popular dishes take hours to make. For 20 years, The Cheesecake Factory's most popular appetizer has been its avocado egg rolls, and they take about four hours to make. The dipping sauce alone is made with 18 ingredients and involves nearly 20 steps. One of its most popular entrees, the chicken madeira, also take awhile to put together. All of the chicken is butchered and processed fresh in house. That includes 2-4 hours, daily, of just pounding the raw meat. 5. The factory burger was axed, but there's still 1 way to get it. Moore said it broke many employees' hearts when the chain recently removed the factory burger (which was basically a cheeseburger assembled on the chain's brown bread) from the menu. It just wasn't selling as well as it used to. However, if you're a longtime guest, especially at the original, Beverly Hills location, the staff will whip it up for you ... if you ask nicely. 6. The chain's best customers come 10 times per week. Odette and Chuck Ebersole have been dining at The Cheesecake Factory for 30 years and they still come in 10-12 times a week Said Moore, “I absolutely know Chuck and Odette still eat at The Cheesecake Factory every week because if something isn’t up to their liking, I get an email.” The retired couple even occasionally stop by Moore's office. "Odette makes a wonderful banana bread," Moore said. "They’re our best guests. They’re a part of our culture at The Cheesecake Factory." "At McDonalds, it’s the french fries. At The Cheesecake Factory, it’s the bread," Moore told TODAY. For restaurant employees, its official name is the whole wheat baguette — but its biggest fans have other monikers. "They call it brown bread or chocolate bread — there are so many versions of what people call it," said Moore. If you don't have The Cheesecake Factory where you live, it's OK. You can now buy its famous brown bread in grocery stores. 8. A lot of the chain's employees stick around for years. 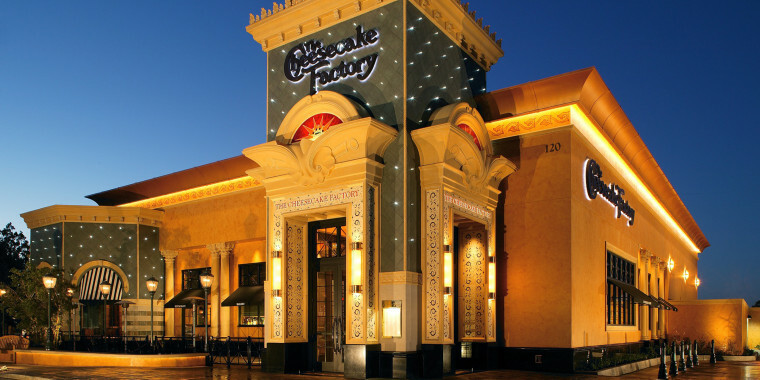 In 2019, The Cheesecake Factory was featured for the sixth consecutive year on Fortune's list of "100 Best Companies to Work for." Moore recently visited a 17-year-old restaurant where he was able to green most employees individually. "I met at least 10 employees, on the hourly level, who have worked for The Cheesecake Factory for 17 years," Moore said. 9. There's an Asian-fusion Cheesecake Factory. The Cheesecake Factory's restaurant portfolio includes four different brands. It includes more than a dozen Grand Luxe Cafes, which have similar menus to the original restaurant (i.e. there's a lot of food) but the cuisine draws inspiration from across the globe. It also includes RockSugar Southeast Asian Kitchen and, as of February, Social Monk Asian Kitchen. Social Monk is different since patrons order at the counter. Its menu is the creation of chef Mohan Ismail — famous for beating chef Bobby Flay on Food Network's popular program, "Beat Bobby Flay."